So I can’t write this post about a Florida Friendly Yard, yet I can write the “movement” towards sustainable or edible front yards is definitely sweeping across the continent! I first read about a Quebec’s couple’s attempt to keep their edible front yard after receiving threats of fines, city intervention, etc. when they posted their petition on change.org, which of course I had to sign. The little city of Drummondville and code enforcers found themselves catapulted into the spotlight when the news spread and people from all over signed the petition not to let the city demolish this beautiful yard! Not only was there a victory for the couple who won the right to keep their yard there was also a victory for sustainable front yards when the city asked this couple to help rewrite the city code regarding front-yard gardens! You can read the well written article by Zachary Slobig on Good magazine’s website by clicking here. 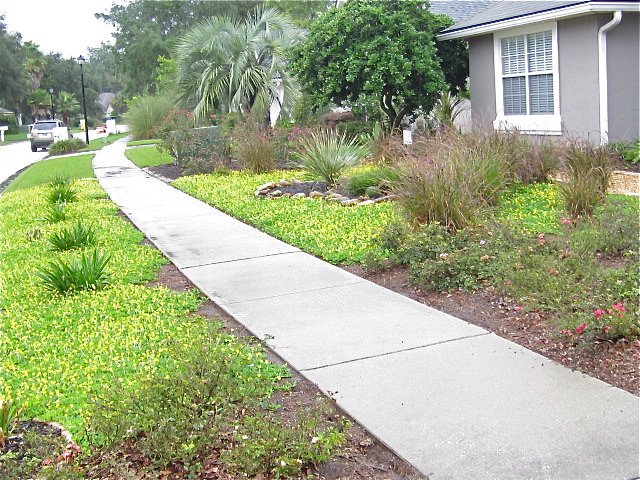 Here in NE Florida, a Duval County couple is fighting to keep the first Gold certified Florida Friendly Landscape (FFL) in Duval County by maintaining the sustainable plantings in their yard’s right of way. Removing these plants and sodding with St. Augustine grass will cost them their FFL gold certification which is exactly what their HOA told them was the only way they would be able to keep their sustainable front yard. The HOA has filed a lawsuit against this couple to force them to remove the plants and sod the area with St. Augustine turf. If you would like to help by signing the petition I started please click here. ‹ PreviousUrban Outlaw Wins Fight To Keep His Yarden! Next ›Do You Know What You Are Eating?